As an aging runner with bad knees, I’ll be on a lifelong quest to find suitable cardio alternatives to my first workout love, running. Luckily I’ve come across a piece of equipment to be my fitness companion as I continue the journey of health and wellness. 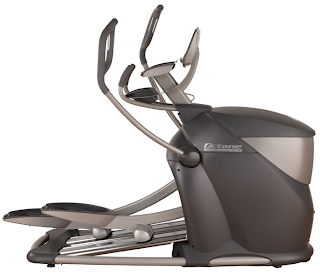 The Octane elliptical machine is a great advancement in low-impact cardio training. The thing I noticed first is how well it approximates the running movement with an adjustable stride length and handles that allow for a closer simulation of the “arm pump” used in running. Furthermore, anecdotally, it feels much closer to the workout I get while running. During an octane session I feel my core engaged and the ability to vary my stride length makes maintaining a pace very similar to my normal running routine. Another great and often overlooked feature is that the stride turnover correlates to the pace I would take on a run. Meaning a 6:30 mile on the octane felt like a 6:30 mile on the treadmill. The Octane Ellipticals, specifically their Q37 and Q47 models, became my go to cardio machines as I rehabbed a knee injury. They far and away provided the best experience I've had on a elliptical machine. So one day after another great workout, I came home and looked up the company. Turns out, I'm not the only one in love with their products. Who was another one of the company's biggest fans? 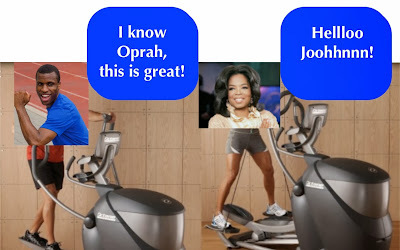 Why none other then Oprah. She placed Octane on her 2012 Favorite Things List. Octane has done a great job in designing their elliptical and having it reviewed. There's a great white paper on their website that goes into specifics about biomechanics and their patented ergonomic designs that Octane uses to provide the best possible workout experience. You can read ithere. •Stride length - customizable on the Q47 and set at an optimal length of 20" for the average sized exerciser on other models. •Stride width/pedal spacing - they moved them closer together to better approximate natural walking and running patterns. •Motion - pedal acceleration and inertia adjustments to allow for a controlled and challenging stride motion throughout a workout. •Handlebars - unique pivot point for improved range of motion in the arm pump. They also created a divergent path of the handlebars that brings hands to the middle as your drive them forward, simulating the arm swing in walking and running. If you are not already using or have not tried an Octane Elliptical, I strongly recommend you do!